Imogen's Typewriter. : My Winter TBR: Pre-Christmas Edition! Did you know Winter doesn't officially start until the 21st of December? The seasons are weird. And I'm ignoring it and writing my Winter TBR now because it's already snowed and the nearing the end of November. That says Winter to me. And I split it up into Christmas and non-Christmas because Christmas reads are dominating the list! Shakespeare's Christmas by Charlaine Harris is the third Lily Bard mystery and putting off reading it until closer to the season has been super difficult. We all know how much I love Charlaine Harris's writing and I've been really enjoying this series so far. I also got the audiobook; Wolfsbane and Mistletoe that she co-wrote after I mentioned in my Audiobooks I Want to Buy and Why post. It's downloaded and ready to go! The one review copy that I have this year to read is The Cat of Yule Cottage by Lili Hayward* and I'm super excited. Cats and Christmas? Those are two of my favourite things! I don't know a huge amount about it but I know the main character is a writer, so my hopes are high. I got the beautiful Penguin English Library edition of A Christmas Carol by Charles Dickens last Christmas from Santa and I haven't read it since I was a kid so I'm looking forward to it. I've seen it in play form and the muppets movie several times so I'm hoping that knowing the story will help with all that Dickensian language I struggle with. And it's pretty short at 94 pages. My second Dickens is actually an anthology with a bunch of Victorian authors; The Haunted House. The idea is that the narrator invites over friends on the Twelfth Night and they tell spooky tales. I love a good ghost story when it gets nearer to Christmas, but the reviews on this are still pretty- eh. We'll see if I get around to it. Another short story collection, that I got for Christmas two years ago, is The Mistletoe Bride and Other Haunting Tales by Kate Mosse. Come Christmas Eve, I'm going to be well and truly spooked. And if I like it, I have her The Winter Ghosts book too. I actually won The Christmas We Met by Kate Lord Brown on Goodreads last October but it didn't show up until February and well- it's a Christmas book so I waited on reading it. I really don't know that much about it apart from that it's set in the seventies and it entered around the main characters mysterious family jewels. And another Goodreads win is The Proposal by Tasmania Perry which I'm actually currently reading. It's set in New York and so far, the descriptions of the city are making me long to visit. When I won this, through some sort of computer error, I was sent 10 copies and the publisher told me to just keep them so- giveaway? I am a terrible, terrible sister who borrowed Batman: Noel by Lee Bermejo from her brother over 4 Christmases ago and never read it. I am determined to actually read it this year because it does look amazing. It's Charles Dickens' A Christmas Carol with Batman as Scrooge. Okay! That's the Christmas books. Onto the others because the self control I had with my Autumn TBR has failed me. Really, I'm just pulling books over from my Autumn TBR. I want to continue the The Chronicles of the Invaders by Jennifer Ridyard and John Connolly and The Lord of the Rings by J.R.R. Tolkien, and I want to start The Edge Chronicles by Paul Stewart and Chris Riddell. We'll see, eh? 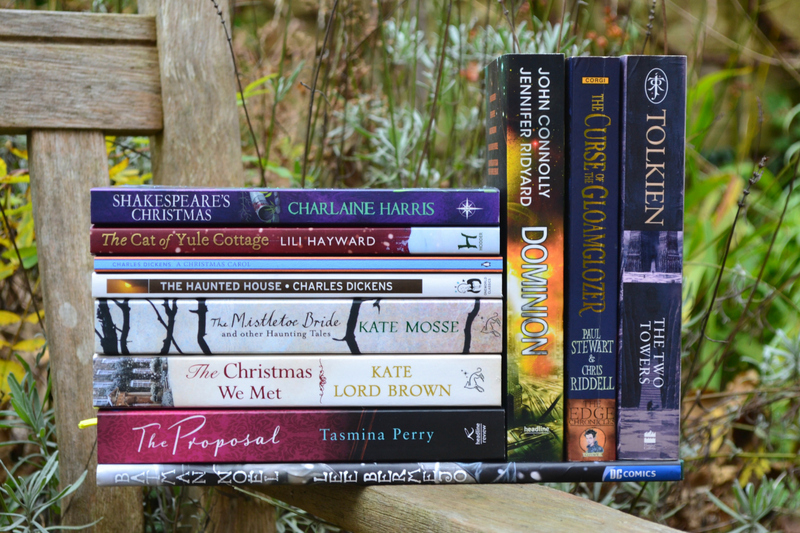 What are you reading in the run-up to Christmas?